District Four-Way Test Speech Contest Chair Ron Petersen has prepared the 2018 Four-Way Test Speech Contest manual in support of the Four-Way Test Speech Contest. The manual contains everything a club needs to get involved. 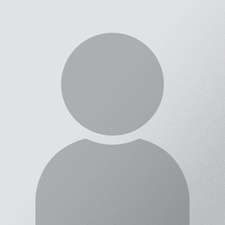 Please read the entire manual to fully understand all aspects. 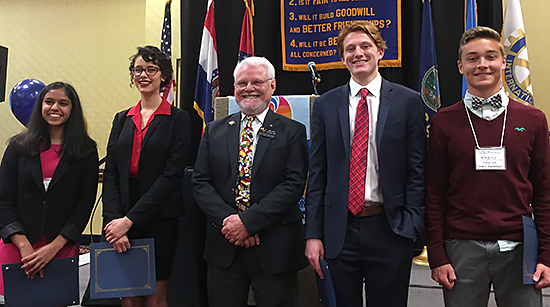 Demonstrating the highest ideals and goals of Rotary, the Four Way Test Speech Contest teaches the principles of the Four Way Test and assists youth in furthering their education and future with monetary awards. It remains can be one of the most popular programs held at the club and district level. Twenty-Three Rotary Clubs participated this year. Many Rotary Delegates were amazed by this year’s ‘final-four” and many left the assembly wondering why their own club did not participate. It didn’t take long for the audience to realize the four were pretty well matched as they entertained and inspired Rotarians at the District Training Assembly on April 14thin Springdale, AR. Priya Thelapurath, sponsored by the Rotary Club of Bentonville and a Sophomore at Bentonville West High School, took home top honors and a $1,000 first place prize. Priya is leaning towards studying Law or Genetics. Jeremy Waldman, a Junior at Iola High School, sponsored by the Rotary Club of Iola, KS. Wiley Battles, a Sophomore at Regent Preparatory School, sponsored by the Rotary Club of Tulsa Sunrise. Marisa Padilla, a Junior at Cassville High School, sponsored by the Rotary Club of Cassville, MO. Each runner-up received $350. These four finalists earned the honor of competing live during the luncheon at the District Training Assembly by winning at club level and state level. Congratulations to them and to the sponsoring clubs. Hope to see more clubs participating next year..
Marisa Padilla – Rotary Club of Cassville, Mo.